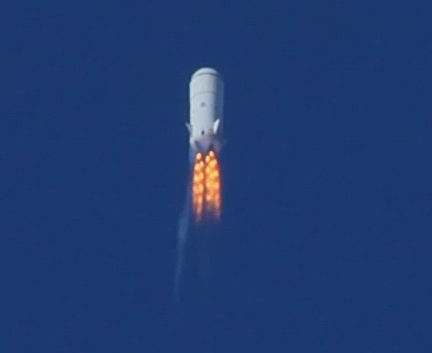 Close up of the BE-3 static fire test (Credits: Blue Origin). Blue Origin successfully made a static firing test of its Blue Engine-3, demonstrating the whole mission cycle its suborbital vehicle New Shepard will experience from launch to landing. “This is a very significant milestone for us because it gets us over a major hurdle and a major risk, and it gets us ready for the checkout of the vehicle and for flight test,” says Blue Origin program manager and president Rob Meyerson. The test took place on November 20; a couple weeks later, the generally low-profile company went public with the results in their first press release since 2012. Founded by Jeff Bezos, also the founder, president, and CEO of Amazon.com, in 2000, Blue Origin is a private space company developing technologies for manned space flight. The company has been working on the development of two separate space vehicles, one for suborbital and the other for orbital flights, with a common characteristic of vertical take-off vertical landing (VTVL) capability. New Shepard is targeted towards the tourists and researchers who want to experience near microgravity conditions for a period of a couple of minutes. The trip starts with a boost phase of around 145 seconds, during which the vehicle is lifted up to an altitude of 50 km. Then, an unpowered phase of around 4.5 minutes follows, where the vehicle continues to climb to an altitude around 100 km with its existing momentum. Close to the apogee, the crew module is separated from the propulsion module and makes a parachute-aided fall to the Earth which ends up with a soft landing. Simultaneously, the propulsion module reenters the atmosphere, restarts its engine to decelerate, and lands autonomously. The propulsion module of the vehicle will be propelled by Blue Engine-3 (BE-3), which uses liquid hydrogen as the propellant. The whole vehicle will be controlled entirely by onboard computers during its mission of approximately 10 minutes. 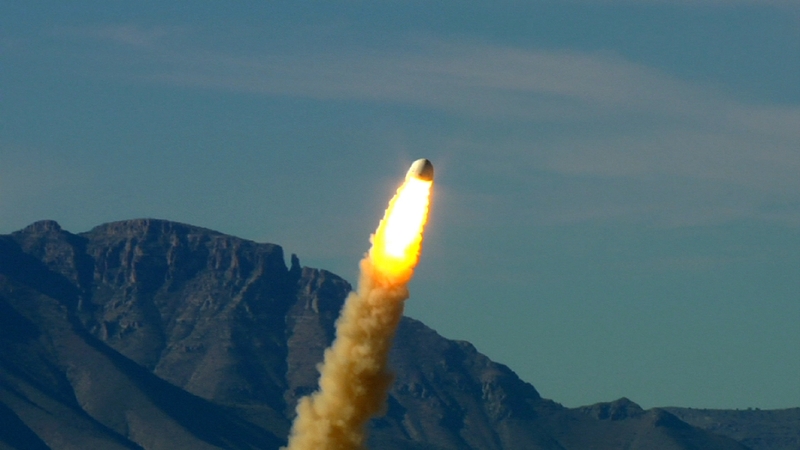 Blue Origin had a successful flight test of a subscale demonstrator of the vehicle, Goddard (PM1), in November 2006. During the test, the cone-shaped vehicle climbed about 85 m before starting to descend, and made a controlled landing back on its legs. In August 2011, the flight test of a full-scale propulsion module was planned, however the test ended in failure. “Flight instability drove an angle of attack that triggered [the] range safety system to terminate thrust on the vehicle,” The company stated in its press release. In October 2012, a successful test was performed to demonstrate the capability of the “pusher escape motor” which performs the separation of the crew module from the propulsion module. In this so-called “Pad Escape” test, a full-scale crew capsule was fired from a ground launch vehicle simulator to an altitude of 800 m under active thrust vector control, and landed softly with the help of a parachute. 2011 test of Blue Origin’s suborbital vehicle (Credits: Blue Origin). Blue Origin is one of the companies that have received funding from NASA in the framework of Commercial Crew Development program. The company had funded contracts with the Agency during the first and second phases of the program (2010-2012), covering many studies on launch abort systems, composite pressure vessels, and especially the BE-3 engines. 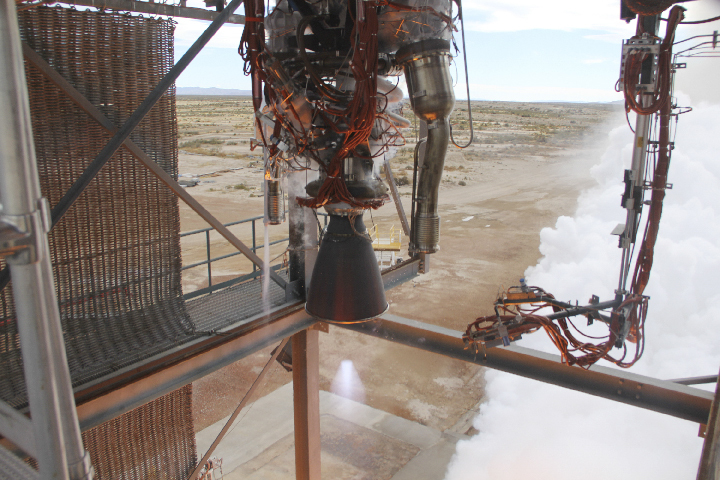 Although Blue Origin did not submit a proposal for the third phase of the program, it currently continues to conduct the tests of BE-3 engine with private funding, as an unfunded extension of the second phase. According to the press release from the company, as of December 2013, the engine has demonstrated more than 160 starts and 9,100 seconds (2.5 h) of operation. BE-3 features a “tap-off” design, in which the combustion gases from around the walls of the main chamber are bled off, partially cooled, and used to power the engine’s turbopumps. This produces a relatively high specific impulse (Isp), is simpler for options such as pre-burning staged-combustion, and is well suited to human spaceflight because of its single combustion chamber and “graceful” shutdown mode. Considering all of these factors, besides being a critical component of the New Shepard vehicle, BE-3 becomes one of the key elements of company’s orbital launch vehicle as well. A 2012 test of the pusher escape system sends the crew capsule to safety (Credits: Blue Origin). Within the scope of orbital missions, the company has a launch configuration consisting of a reusable orbital space vehicle (SV) and a two-stage orbital launch vehicle (OLV). SV, being a biconic-shaped crew module, will be capable of hosting seven astronauts. Although the current crew size of the International Space Station (ISS) is six, seven is NASA’s planned crew size for future missions to the station. During an orbital mission, the first stage of OLV, -possibly- consisting of a cluster of BE-3’s, will lift the vehicle up to certain altitude, separate, and make a vertical landing. This stage is planned to be fully reusable. Following the stage separation, the upper stage of OLV, which uses a BE-3U engine (a modified version of BE-3 for vacuum conditions), will continue to propel the crew module to ISS. This second stage will be expandable and will not be recycled. On the way back from orbit, the SV will reenter Earth atmosphere and make a soft landing with the help of its parachutes. As of April 2012, Blue Origin successfully completed a System Requirements Review (SRR) of its orbital space vehicle and also performed extensive wind tunnel tests of the biconic SV. Since the OLV will use the same engine family as the suborbital vehicle, the performed BE-3 tests to date also contribute to the company’s orbital program. However, until the OLV is made sufficiently reliable for manned missions, the company plans to launch the SV aboard an Atlas 5 rocket. Blue Origin states that it remains on track to perform its first orbital flight in 2018 and would like to base its orbital launch operation at launch pad 39A of NASA’s Kennedy Space Center in Florida. However, Space Exploration Technologies Corp. (SpaceX) is also vying for this pad; NASA’s decision is currently on hold pending a review of the solicitation by the U.S. Government Accountability Office (GAO) in response to a protest by Blue Origin. “We believe we’ve submitted a proposal that provides the fullest commercial use of the facility,” president Rob Meyerson NBC News. “If the outcome is that our proposal is not selected, we have many other options. We are looking at those options and we would continue to look at them.” The GAO is expected to issue a ruling by December 12. Feature image caption: Blue Origin’s November 20th BE-3 test fire (Credits: NASA).